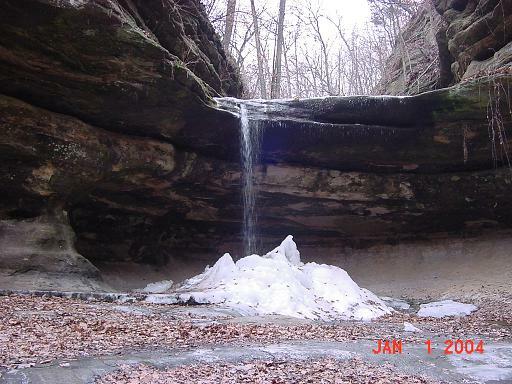 This was my second annual New Years Day hike at Starved Rock State Park. Just like last year I hiked from the lodge to Council Overhang and back (10 miles round trip). Temperature was high 30s, which made for some muddy (and slippery) hiking on the return trip as the ground began to thaw. Just like last year, I had a good time. This is a great way to start the new year. I wonder how many people were nursing hangovers this morning ... I'd rather be hiking! 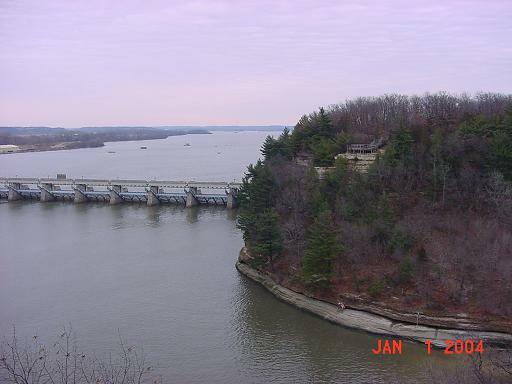 Lovers Leap as seen from Starved Rock. Wildcat Canyon was dry last year. There was only a small amount of water / ice at these 70' falls this year. 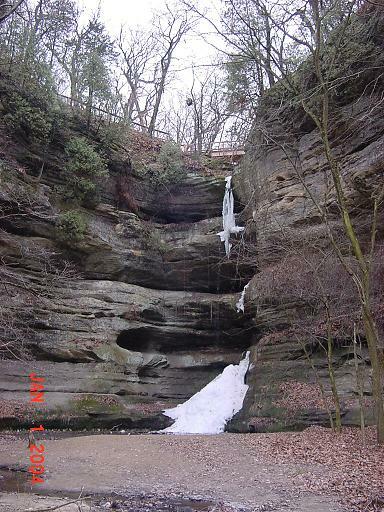 I was here about twenty years ago and saw a climber climbing the frozen falls! Me at the base of Wildcat Canyon falls. 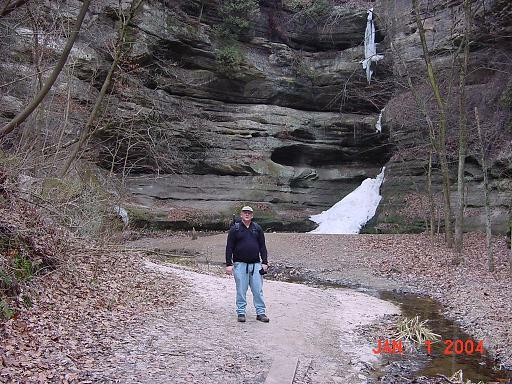 Me at LaSalle Canyon falls. These, too, were dry last year. 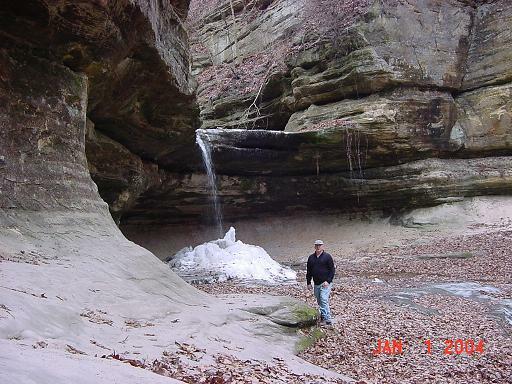 Another view of LaSalle Canyon falls. 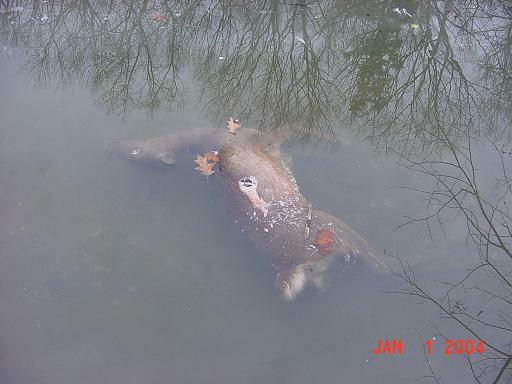 This deer was in the water at the bridge where LaSalle Canyon meets the Illinois River. Oh sure, I was tempted to pull him out and salvage what I could (especially an astragalus bone) but I've been there before! Besides, this is a state park and such activites are probably frowned upon! 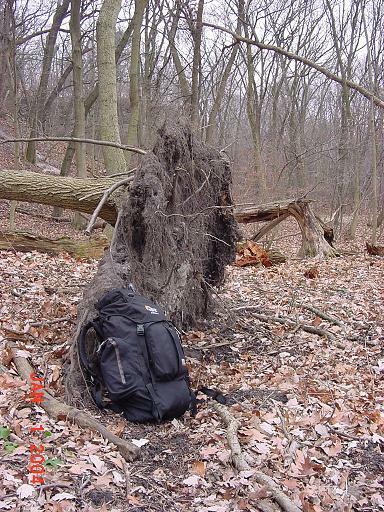 The roots of this fallen tree provided an opportunity to practice some survival skills. 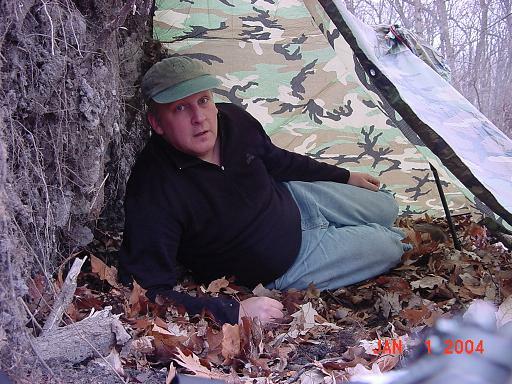 It took only twenty minutes to create an emergency shelter using my poncho. Very nice! If this were a true emergency, rather than a short diversion from my hike, I would gather a pile of leaves about two feet deep and construct the shelter over it. I would use the poncho to transport the leaves. Alas, camping is not allowed in this area...on with the hike! 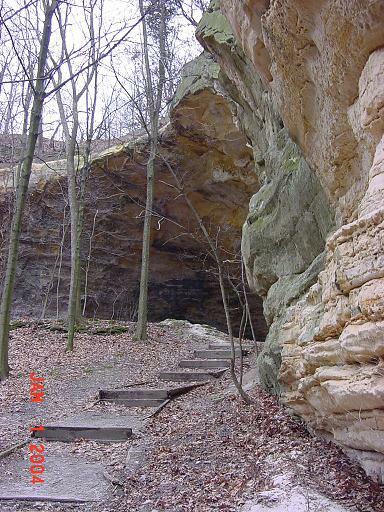 The entrance to Council Overhang. 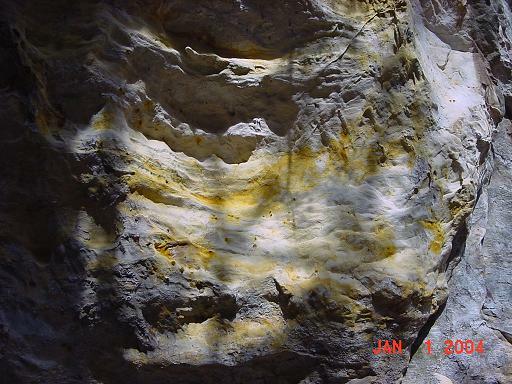 The sun came out for one brief moment, allowing me to get a picture of the beautiful yellows in the sandstone that is the ceiling to Council Overhang. 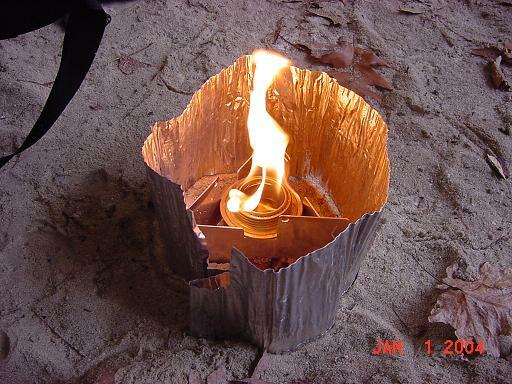 I really like my Trangia alcohol stove. 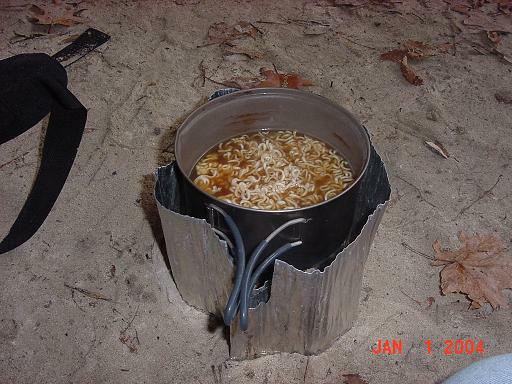 Ramen soup tastes great after hiking five miles in the cold! I'm still trying to figure out what these are. I doubt they are edible - red berries seldom are. I'll update this page as soon as I find out! Jan 2, 2004 - At this time opinions are divided over Viburnum Trilobum (American Bush Cranberry) or Parthenocissus Quinquefolia (Virginia Creeper) or Nightshade. 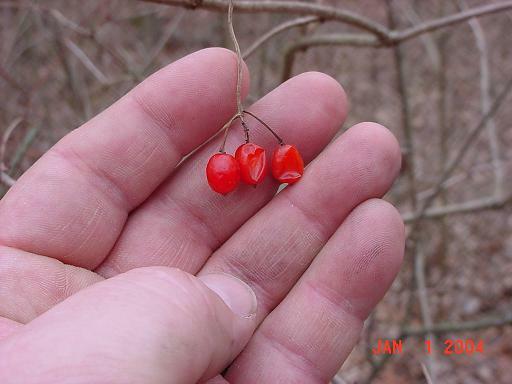 Jan 16, 2005 - I'm pretty sure it's red nightshade. See http://wut2c.com/Activities/Survival%20Trips/poisonous.htm. Copyright © 2004 by Bill Qualls. Last updated January 16, 2005.